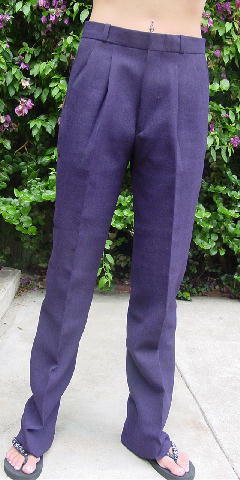 These vintage 100% texturized woven polyester dark purple pants are by Giorgio Gibboti Italy. They have a 6 3/4" long zipper fly. 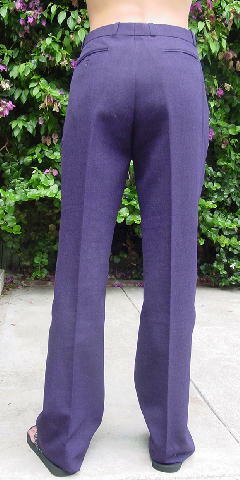 There is a 1 3/8" wide waistband with belt loops. There are 2 front diagonal pockets and 2 back pockets, 1 with a button closure. They have a 2 1/2" hem. They were worn in several photo shoots on both a male and a female model. waist to hem 43 7/8"